"the darker side of human existence"
Who come from the deserts of the dead. AND will be able to see the audience in the other grid!! This is a really cool bridging of the Grid Divide! This world is public and open to all Kitely and Hypergrid residents. Guests are encouraged to wander freely about the property exploring and discovering. So drop by any time! 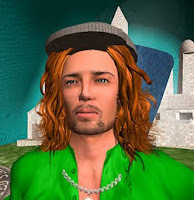 Ask Shandon Loring for a Group Invite to receive all notices from the Seanchai Library - and to gain access to our additional story-themed worlds in Kitely.